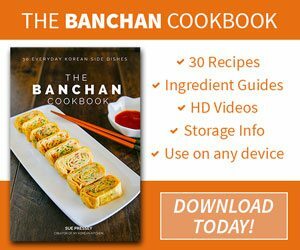 Learn to make popular Korean winter street food – Hotteok (Korean sweet pancakes). It’s crispy outside and inside is filled with sweet gooey indulgence! Today I’m sharing my sweet tooth love with you. 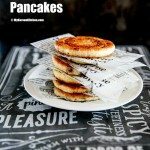 I’m here to present my Korean sweet pancakes (Hotteok, Hoddeok or Hodduk, 호떡) recipe! My original recipe is like 9 years old now and I wanted to revamp this recipe for a while with a better, clearer & quicker version and some new photos. Seriously, these Korean sweet pancakes used to be my favourite childhood snack! I was always excited tagging along with my mum when she went grocery shopping. Because it meant I would get an opportunity to have some pancakes on my way home! Who would say no to that?! 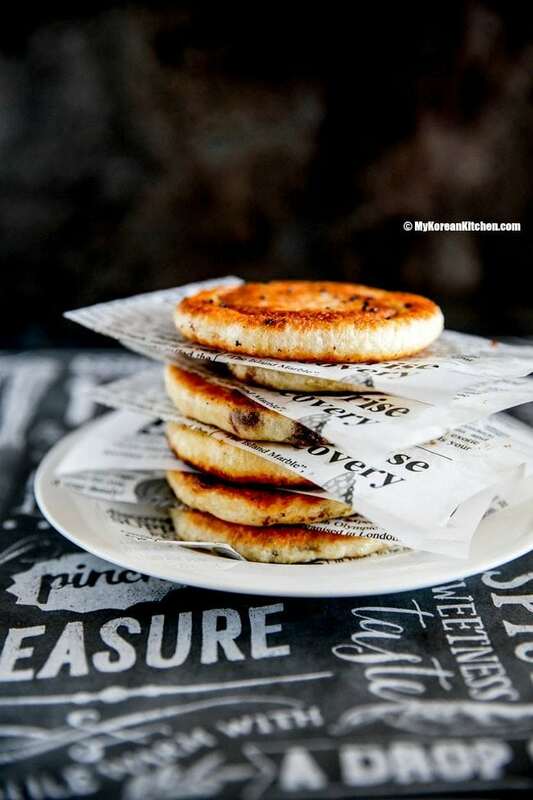 Korean sweet pancakes (Hotteok) are one of the most popular Korean street snacks. They are particularly popular in winter. They were introduced by Chinese immigrants in the early 1900s in Korea. 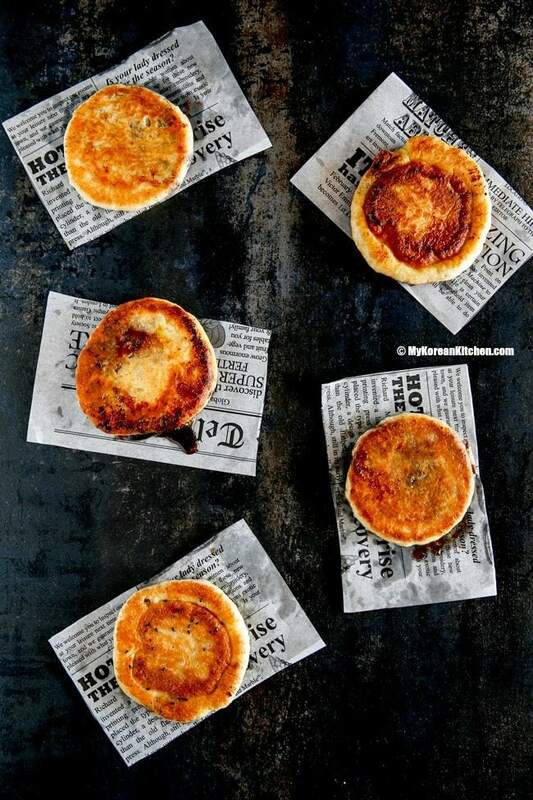 Typically they are stuffed with dark brown sugar, cinnamon powder & some grounded nuts or seeds but in recent times savoury style pancakes (vegetable, Kimchi, Bulgogi or cheese etc. stuffed) are also available. Commonly the colour of the uncooked pancake (dough) is white but green tea coloured and flavoured pancakes are also available. You can also buy premix versions from a Korean grocery store. I haven’t tried vegetable stuffed versions yet but whether I do or not, I know my love will always be with the sweetened pancakes. 🙂 It really smells and tastes heavenly. It’s stuffed with sweet gooey syrup. ? Who can resist it?! Give it a try and let me know what you thought of it! 2. Once the dough is raised, release the gas by punching the dough with your hands a few times. Cover with the wrap again and rest for another 20 mins. 3. When the dough is ready, put some cooking oil on your hands (for anti stick purpose) and separate the dough to allow 6 medium sized pancakes to be made. 4. 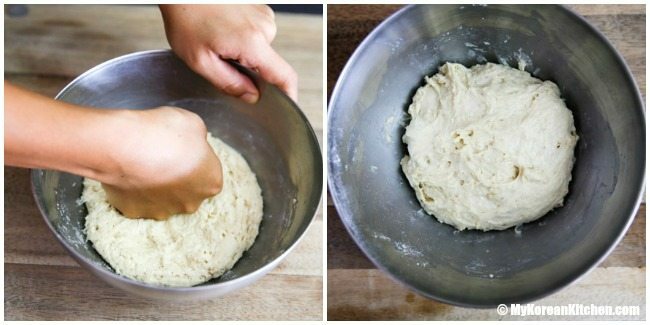 Put one of the pieces of dough on your hand, flatten the dough with your hands so that you can add about 1 Tbsp size filling onto it. Once it’s done, seal the dough by gathering the corners. Repeat this for the remaining dough. 5. Pre heat a frying pan on medium heat and once it’s heated add a thin layer of cooking oil. 6. Place a dough (1 or more depending on size of your pan. If more, allow enough room to expand between the dough when pressed down) into the pan and cook it on medium heat until the bottom side is lightly golden brown (about 30 seconds). Flip it over and press the dough down with a solid turner or professional press. Cook until the bottom part is golden brown (about 1 min). Flip the pancake over one last time then reduce the heat to low. Cover the pan with a lid and cook until the sugar filing fully melts (about 1 min). – It is still edible if you don’t further cook with a lid on but not all the sugar filling will be melted. 7. Transfer the pancake onto a plate and repeat step 6 for the remaining dough. Enjoy hot! It tastes best when you eat it while it’s still “bearably” hot. Take extra caution when you approach the sugar filling as it can be really hot especially for young children. I used instant dry yeast in this recipe, so I didn’t need to activate (proof) before adding it to rest of the dough ingredients. You can learn more about active dry yeast and instant yeast from this article. It is best to consume all the pancakes on the day of making them. While it reheats well in a microwave the filling isn’t as gooey after a while as it’s mostly soaked into the dough (the gooey filling is part of its attraction!). Once the dough is raised, release the gas by punching the dough with your hands a few times. Cover with the wrap again and rest for another 20 mins. When the dough is ready, put some cooking oil on your hands (for anti stick purpose) and separate the dough to allow 6 medium sized pancakes to be made. 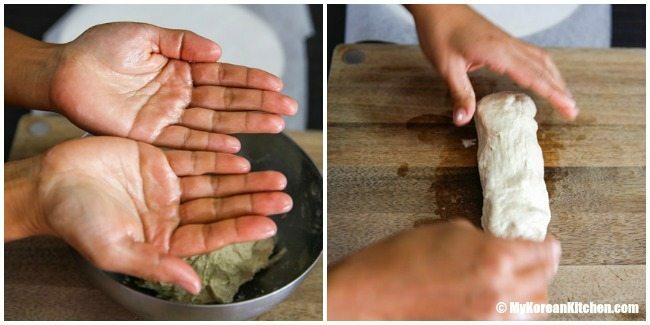 Put one of the pieces of dough on your hand, flatten the dough with your hands so that you can add about 1 Tbsp size filling onto it. Once it’s done, seal the dough by gathering the corners. Repeat this for the remaining dough. Pre heat a frying pan on medium heat and once it’s heated add a thin layer of cooking oil. 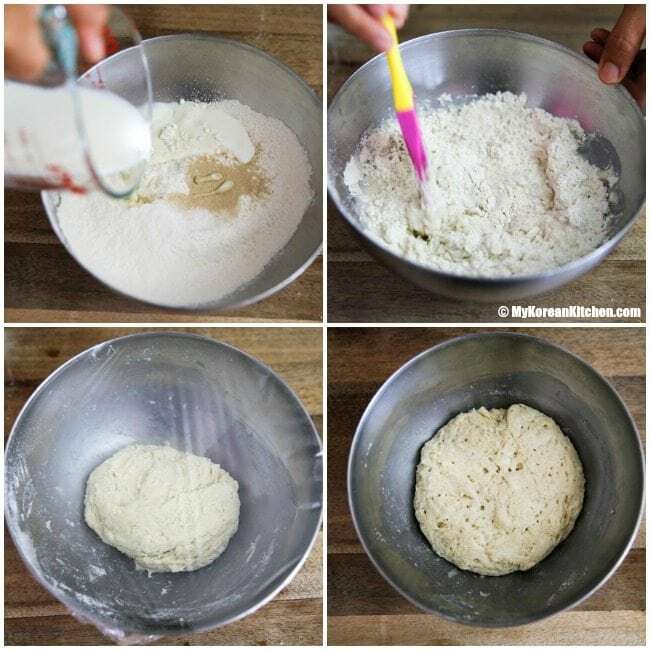 Place a dough (1 or more depending on size of your pan. If more, allow enough room to expand between the dough when pressed down) into the pan and cook it on medium heat until the bottom side is lightly golden brown (about 30 seconds). Flip it over and press the dough down with a solid turner or professional hotteok press. Cook until the bottom part is golden brown (about 1 min). Flip the pancake over one last time then reduce the heat to low. Cover the pan with a lid and cook until the sugar filing fully melts (about 1 min). – It is still edible if you don’t further cook with a lid on but not all the sugar filling will be melted. Transfer the pancake onto a plate and repeat step 6 for the remaining dough. Enjoy hot! We do have this version in the Philippines but we actually call it Piaya. It’s absolutely delicious as it also comes with different varieties. Honestly, I didn’t know that Korean has its version as well. Hi. I love this dish a lot and have made some before. Just a quick note – I don’t think the oil should be put in there since it’s just for separating the dough. It confused me enough that I accidentally put it in. Just something that bothered me a teeny tiny bit 🙂 This shouldn’t change much, though? 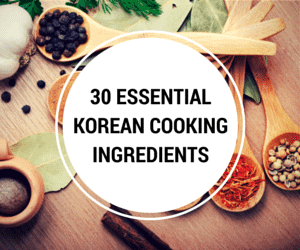 My daughter (14yo) loves all things Korean and became an expert in making Hotteok! We double or (next time) even triple Your recipe, so the kids can take leftovers to school. With the sweet stuffing there’s no need for anything extra, so very convenient. Thanks a lot for all your recipes! Looks Yummy. 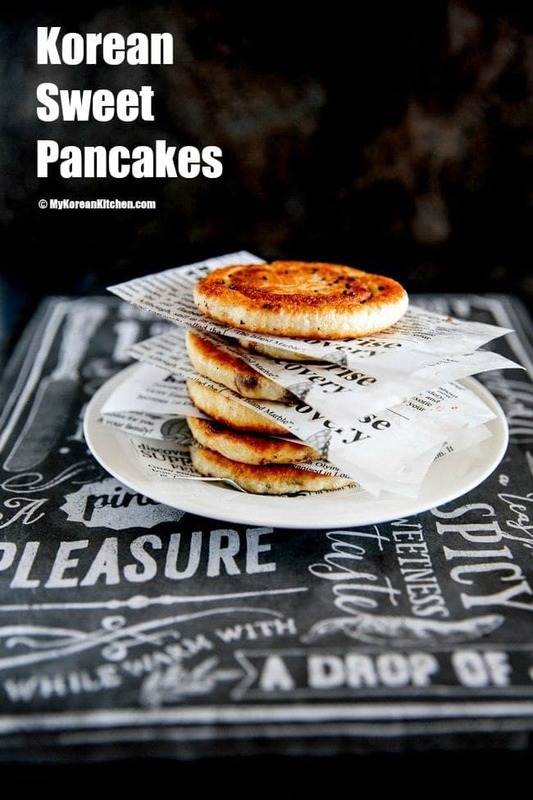 Will try the Sweet Pancakes this weekend and get back to you. I think it should be OK. The shorter gap there is the better for the dough (for not breaking apart). I don’t know what that liquid might be. I was going to say “oil”. Also, there are different types of hotteok available nowadays. This recipe is first generation (original style). ? Im going to service this in my korean bakery and restaurant biz. Im a lifestyle blogger from Manila. Sue, am I able to print these recipes, would be so much easier for me. Hi Ann, There’s a recipe print button at the end of the post. Enjoy! I am hoping on making these for a large group as part of a dinner party. Do you have any suggestions on how I could make them ahead of time to cut down on the preparation time just before the party. 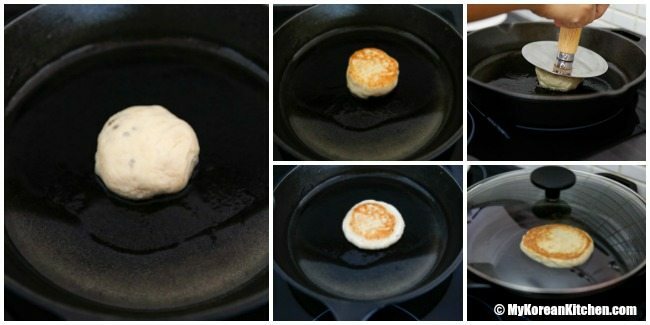 Could I have each little pancake prepared and filled the night before and then cook them just before the party? Hi Amy, I don’t think making it the night before and cooking it the next day will work well. 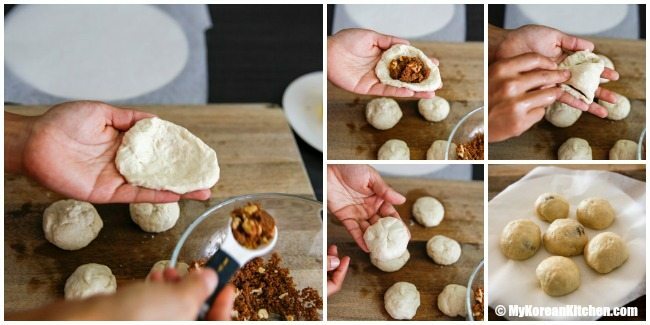 I have an experience with a similar dessert (https://mykoreankitchen.com/nutella-stuffed-sweet-rice-flour-doughnut-holes/) and it was pretty messy experience with only 50% success rate. You should read my comment in the ‘Note’ section of the link above. Thanks. Have you ever used the oven to reheat instead of the microwave? Any difference? Or do you think I can cook them a few hours earlier and keep them warm somehow? Suggestions. I do love the gooey filling as well so I am trying to see how to keep that while still making ahead. I love hoddeok so much, but it’s getting so difficult to find it on the streets of Seoul, so I decided to try to wing it and make my own this winter. They were good, but these look better. I’ll have to try this recipe next time. I never have heard of Hotteok before but they look so delicious that i have to try them! These look super tasty and are so unique! Pinning for sure! These look delicious, perfect to take to work or pop in the lunch box! Yummmmy, I am making these once I am done with my whole 30 diet I have been doing, which has been getting rid of the stubborn 10 pounds of baby weight that wouldn’t go away. 🙂 Every recipe I have made of yours has been amazing. Oh yum! I’ve never been to Korea and will probably never get the chance to go, but thank goodness (andSue) I don’t have to miss out on one of the world’great cuisines. 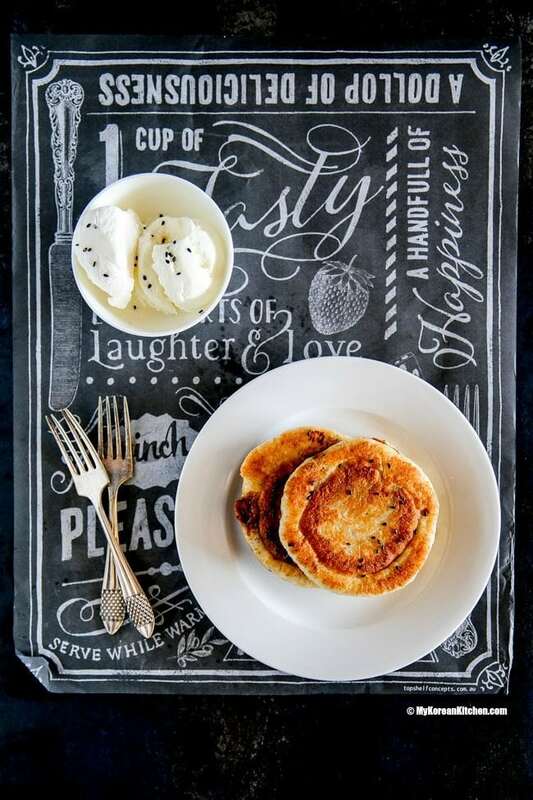 I am so making these pancakes for dessert tonight. Don’t say never! I hope you get to visit Korea one day, Robbie! You never know! 🙂 Enjoy the sweet treat! I will definitely make this and I already know I am going to love it! Hope you like it! Let me know what you thought of it! ? I going to try this next time. I had tasted it when I was in Nampo-dong, Busan and I loved it. Thanks for sharing ? In the picture, you have a plate and something else on top of the pancake. What is the thing on top of the plate? Where can I find this tool? I’m so going to try doing this at home. 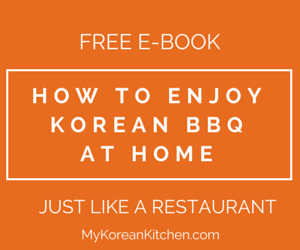 I’m so happy that I have found a website where I can find so many recipe for Korean food. I can’t wait to make these and share them with my besties. ❤? I’m happy that you found my website too! Enjoy! ?